Here in the UK, in the last few days, we have had a far greater amount of rain than normal with rivers bursting their banks and excessive amounts of water on our roads with some vehicles finding themselves partially submerged in water. So, what is the situation as far as your car insurance is concerned-are you covered? Partially submerged cars-will the owners' car insurance pay out? The advice is to check your individual policy. If you have taken out fully comprehensive car insurance cover you should find that you are covered for damage caused by flooding. However, the policyholder may have to pay an excess although this may depend upon how much damage has been caused. If you only have third party, fire and theft you are less likely to have cover but read your policy document carefully to check this out and pick up the phone to your car insurance company to discuss the matter with them. You should contact your car insurance provider as soon as possible if you are considering claiming on your car insurance as you may well end up in a long queue of other claimants and that may delay your claim. If you have fallen foul of the weather and you walk out of your front door to find your car partially submerged in a street of flowing water do not try to turn the ignition on. This may cause a great deal of damage to the engine that may not be covered by your car insurance policy. Contact your insurance company to find out if they have a list of approved garages that can arrange for your car to be professionally dried out. 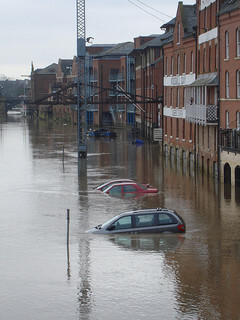 Hindsight is a lovely thing but, to reduce the possibility of your car getting caught up in floodwater in the future, park it on high ground so that flood water can’t get to it. This entry was posted in News and tagged car, car insurance, Car Insurance Company, Fully comprehensive, Third Party Fire and Theft. Bookmark the permalink.